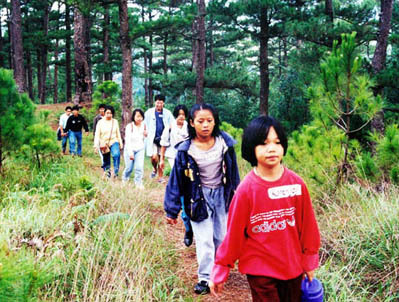 OUTDOOR CLASROOM - A legacy that Baguio newsmen can truly be proud of is the Eco-Walk program that they conceived in the early nineties as a result of an instruction from a Catholic Bishop that led a re-greening movement. 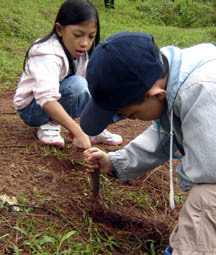 Aside from planting and taking care of trees in the forest, Eco-Walk is also a walkabout experiencial learning and value formation program designed for children where they can relate with nature in the truest sense of the word. 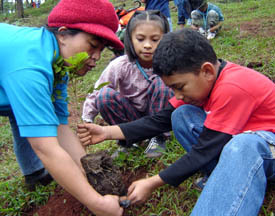 Adults and youth groups from as far as Minadanao has visited the Eco-Walk Forest called Busol Watershed. "Children are constant reminder from God that the world must go on." 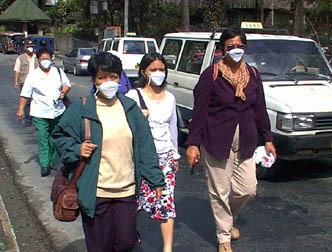 Clean Air Movement - In a drive against vehicular and industrial pollution, Redempta Baluda, Tam Jewel Tibaldo and Baboo Mondonedo are shown wearing respiratory masks to dramatize the need for a conscientious and effective program that can solve air pollution problems. 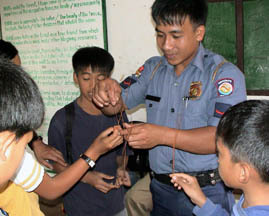 For this young police officer, its back to playtime with much younger boys and even girls who searched for the longest pine needle that they have found in the forest. Rewards are often given by guests and the newsmen themselves. Claire Tomas of Taloy, Tuba Benguet reponds to a call to re-green roads and highways and she is shown de-weeding and planting a shrub in front of the defaced bust of the late strongman Ferdinand Marcos. We do not only write stories about trees but we also plant them and engage others especially children to learn and benefit from it. 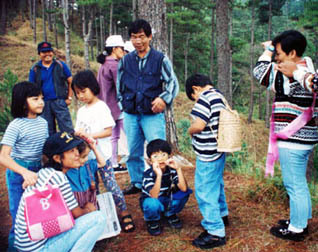 Left photo shows Ramon Dacawi (one of the five Baguio newsmen who concieved the program) briefing young schoolers in one of the numerous environmental awareness lectures at the watershed. 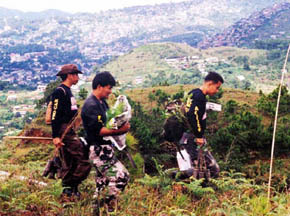 Upper left photo shows young environmentalist Tam Jewel Tibaldo (wearing a bandana) who together with Dacawi went to China in 2002 to recieve the Global 500 Laureate Award given by the United Nations Environment Programme (UNEP). 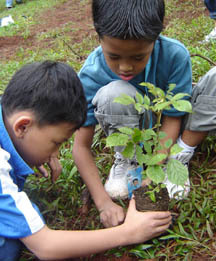 Lower photo shows schoolers from the Baguio City Science Foundation who also planted a variety of tree seedlings at the Baguio Botanical Garden. Green Army - they can aptly be called such as they are not only fit for present day combat but are also geared up for future survival. 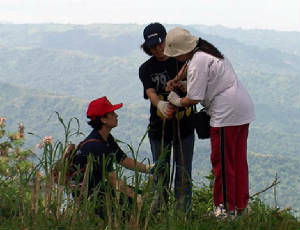 The site shown at the far background is the Baguio-La Trinidad boundary pragmatically named Centennial Forest. 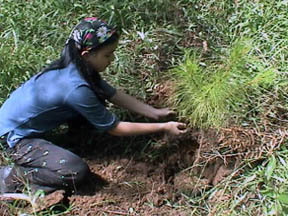 Like many local government units faced with the problem of watershed denudation, Baguio City has risen to the challenge of preserving what is left and planting for the future. With the support of teachers, village leaders, government employees and other stakeholders, the city and the Baguio Regreening Movement turned to children, media and indigenous culture in a fight to save its major water source - the Busol Watershed. Eco-Walk promotes value formation among children and even adults as the key to arresting environmental degradation. In a related development, the Cordillera News Agency has also made tie ups with the Maximo T. Kalaw Foundation and Haribon Foundation and formulated a training module on Eco-Warriorship for the National Security Training Program (formerly ROTC).